The Alabama Child Labor Law is a child labor law poster by the Alabama Department Of Labor. This poster is mandatory for some employers, including employers of minors. This poster must be posted in a conspicuous place where any person under age 18 is employed in Alabama. It specifies rules on the number of hours and work times that can be assigned to minors of different ages, and specifies certain exemptions to various child-labor regulations. It appears you don't have a PDF plugin for this browser. 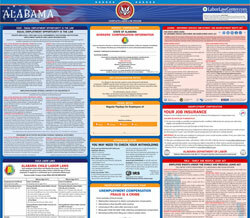 Please see the link below to download alabama-childlaborlawposter-english.pdf. to serve alcoholic beverages for consumption on premises (19 if licensee is RVP certified). 16 and older may be employed in such establishments as busboys, janitors, dishwashers, cooks, hostesses, or seaters. state or federal law regarding child labor, the law providing the most protection to the minor takes precedence. department shall enforce this act and may administer fines and/or prosecution for any violation of this act. 14 and 15 year old minors SHALL NOT work in any establishment that serves alcohol for consumption on premises. for more than 5 hours continuously.